This prayer before the Blessed Sacrament by St. Alphonsus Liguori (pictured above), the celebrated 18th century theologian and founder of the Redemptorists order, is a moving and fitting way to begin a visit of adoration and meditation with our Lord there. Finally, my dear Saviour, I unite all my desires with the desires of Your most loving Heart; and I offer them, thus united, to the Eternal Father, and beseech Him, in Your name and for love of You, to accept and grant them. 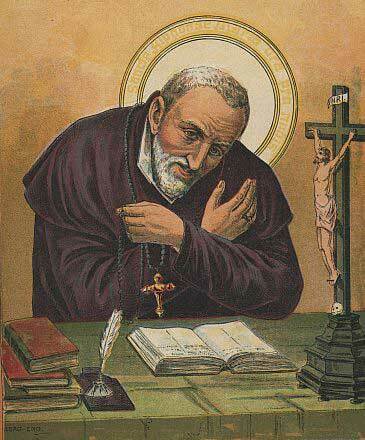 St. Alphonsus Liguori was known as a tireless champion of our faith, both as a preacher and a prolific author of over 100 theological works that have since been translated into over 60 languages! His poignant prayers for the Stations of the Cross are still used in services, especially during Lent. This prayer, which truly reflects this great saint’s devotion to our Lord, comes from his first book, published in 1745, entitled Visits to the Blessed Sacrament. It is still in print today, along with his other classics like The Glories of Mary, a stirring and highly informative series of essays and meditations devoted to our Blessed Mother. Do you have days when you feel like you’re carrying the whole world on your shoulders? Let Jesus help you! When you visit Him in the Blessed Sacrament, pray for His guidance as you turn your problems over to Him. Our Lord can give you the grace to cope with stress as He helps you carry your cross on the road to Eternal Life! May this prayer help you draw closer to Christ in a spirit of true contrition, humility, and joy from His presence and His peace.